Given three walnut half-shells and a single pea, our con-man at the county fair switches the shells from position to position faster than the eye can see. Then he asks “Which shell hides the pea?” You have one chance in three! In Obama’s game there is no pea!! There is marvelous sleight of hand, thousand page documents that nobody reads, and a gremlin lurking behind every provision of a fundamentally deceitful document. Obama is the chief architect, while America and the American people are irrelevant to any good that may come from his administration. For better or worse Obama has succeeded magnificently in one respect; He has awakened the good people of this country to the antics in Washington, the inane and archaic activities passed off in the name of government, and the processes used by the political parties to obfuscate and corrupt any semblance of responsible legislative and executive conduct. 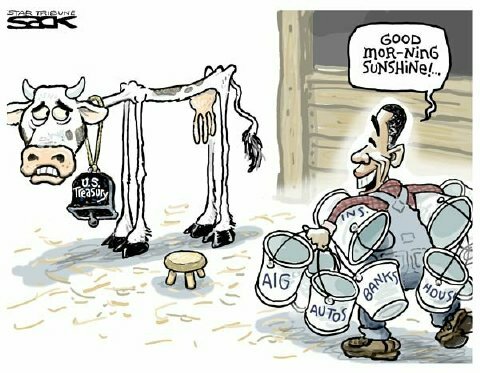 The milking of the US Treasury, as illustrated in the Star Tribune, is but the tip of the iceberg. The smell from the shenanigans in Washington over the past year is beyond belief. Little by little the real Obama, like a jigsaw puzzle, has been re-assembled piece by piece, and the full picture has only now come into full view. The good news of Obama’s picture is that he has shown the man on the street the extent to which the problem with our government is far wider and deeper then just our President. The government’s problem shows a system so corrupt through inane rules and archaic procedures that the product no longer represents a government of, by, and for the people. The current product comes from a dysfunctional family so detached from the people that our representatives no longer talk to the people, hold meetings with constituents, or conduct reasoned debate over the central issues facing the country. While Obama would have us believe that he is pulling for the little guy, he is subverting all working Americans by forcing their hand to become a part of the great unwashed who depend upon Washington and big government. Obama knows nothing of the opportunity to become a part of the most effective market-based economy of free enterprise on the face of the earth. Many of those supporting him have been blinded by his verbal deceit, slick talk on helping the poor, and currently tough talk about saving the planet. He is none of these things. Obama is a clone of the folks he has chosen as associates. Obama is a marginal American, at best, who knows nothing about the American Dream, and is driven by the fairy tale of rebuilding America “brick by brick” according to his academic and social mentors. As a community activist, he has never run anything, never handled a budget, never functioned as an executive, and has never been held accountable to anybody. In Illinois he revealed his responsibility to the people by voting “present” over 130 times. He knows only con-games, behind the scenes “organizing”, and creative psychopathic story-telling in front of the microphones. His record of characterizing good Americans is to demonize them all, except for those who are currently kissing up to his administration. While Michelle has stated on a single occasion that she “was proud of America for the first time” (at age 46), Barack has never admitted such a revelation. Barack is not a proud American, has never been proud of America, and on one occasion claimed foreign citizenship in order to qualify for financial assistance. What kind of American would stoop to such a level. The answer is a psychopath, who will say anything, do anything, plan anything, and surround himself by those who are exactly like him. He and his anarchist friends will gladly destroy America and its Constitution, and never look back. He would justify destroying America by stating that the Constitution “does not go far enough” in furthering his political ends. What the Obama administration has accomplished is to reveal the extent to which the federal (and many states) governments have become completely non-functional. The executive branch is writing legislation in the back rooms of the White House. The legislative branch is meeting behind closed doors and “deeming” that they have passed legislation which they have never read, have never seen, and do not understand. The legislative rules have become so arcane that bills are passed and signed in advance with complete knowledge that all the specific provisions of the law will be written later, or will be interpreted by bureaucratic departments of the Executive. From the outset, our president has never come across as a patriotic American. This may be clearer from Michelle’s comment immediately after his nomination that “for the first time in her life, she is proud to be an American”. This revealing admission describes the character of those with whom the first family has freely associated. His background suggests he was never a part of mainstream America, nor an integral part of those who have made America great. Consistent with his 20 year association with the Rev. Jeremiah Wright, Obama has merged imperceptibly with those many folks who blame America first. This he has demonstrated amply through his apologizing for America’s “dismissive, even derisive conduct” around the globe. These are predominantly Obama’s own personal characteristics, which he readily projects upon those who surround him. They are his kind of people; dismissive, derisive, and arrogant. Hello! The tea party has only begun.